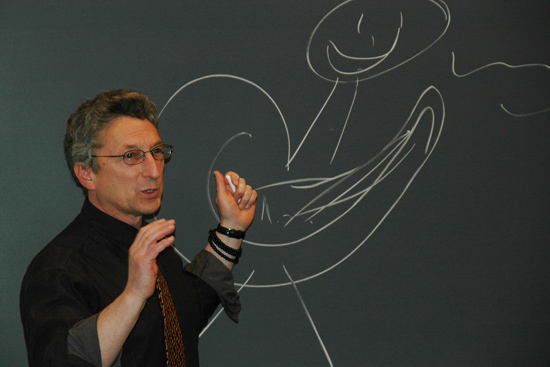 Above, Rob Rosenthal, professor of sociology and director of the Service-Learning Center, draws a troubadour to illustrate how the message of music is perceived differently during a lecture to high school students. 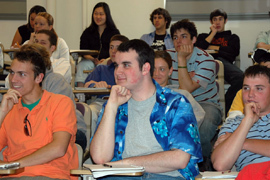 At right, high school students listen to Rosenthal’s lecture during the High School Humanities Program. This semester, local high school students read The Odyssey, and watched O Brother, Where Art Thou, but it wasnt with their high school English teachers. As part of the High School Humanities Program, more than 80 high school students had the opportunity to participate in six discussions at Wesleyan. Wesleyan faculty members facilitate the lectures. Students were bussed in from Vinal Technical High School and Middletown, Killingworth, Mercy and Xavier high schools. Rob Rosenthal, professor of sociology and director of the Service-Learning Center, lectured about social music and culture on May 6. He played music samples for the students including songs by Woody Guthrie and Aretha Franklin. Rosenthal sketched a troubadour and other people on the chalkboard to illustrate how the music, or the message, is interpreted differently. One person may really favor the lyrics, another may like the beat and rhythm, and still another may not really be paying any attention, he explained. The High School Humanities Program is supported by Community and University Services for Education, most commonly known as CAUSE. Established in 1967 by Marjorie Daltry Rosenbaum, CAUSE facilitates the implementation of cooperative programs and projects between Wesleyan, the Middletown community and the public and private schools in the Middletown area. The Art Show, a unique exhibition of more than 1,200 artworks of Middletown students in grades K-12 at Wesleyans Zilkha Gallery. This annual event in April showcases the art curriculum in Middletown public schools and attracts hundreds of students and their families to the Wesleyan campus each spring. Silent Sounds, a collection of selected literary works submitted by students in Middletown Public Schools grades 6-12. Categories include poetry, short stories, literary analyses and personal essays. Mini-grants to local Middletown teachers to develop innovative and creative short-term projects to engage their students in learning. Rosenthal is one of six professors involved with the High School Humanities Program. Other lecturers this semester have included Andy Szegedy-Maszak, the Jane A. Seney Professor of Greek, professor of classical studies, and the director of the Center for Faculty Career Development; Richard Slotkin, the Olin Professor of English and professor of American Studies; Indira Karamcheti, associate professor of English, associate professor of American studies and associate professor of womens studies; Kate Rushin, adjunct assistant professor and visiting writer of African American studies; and Sean McCann, associate professor of English, associate professor of American studies and chair of the American Studies Program. Peter Frenzel, professor of German Studies Emeritus, served as faculty director of the program and Frank Kuan, director of Community Relations, offered administrative support for the program. For more information, call 860-685-2245 or 860-638-1401. 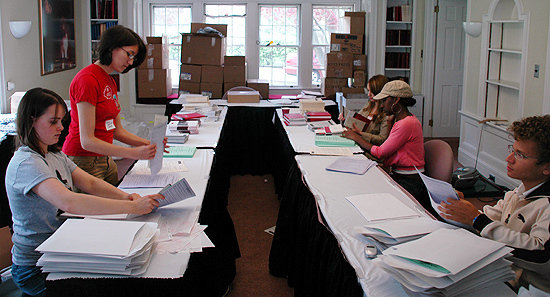 At top, hired students worked stuffed 3,000 packets and created nametags in preparation for Reunion & Commencement Weekend at University Relations. At left, Gemma Ebstein, director of Alumni and Parent Relations and Deana Hutson, director of Events, look over Reunion & Commencement Weekend schedules prior to the four-day event. It all starts the day after. Deana Hutson, director of Events, began planning for the 2005 Reunion & Commencement Weekend the day after the 2004 Commencement Weekend ended. On the agenda: Hire 150 student workers. Print 20,000 brochures. Rent 10,000 chairs. Block 900 local hotel rooms. Contact 50 vendors. Plan events for 9,000 guests. On May 16, just three days before the big weekend, Hutson and Gemma Ebstein, director of Alumni and Parent Relations, spend their day going through a pen-scribbled list and an 80-page flow document. The document details who is in charge of each event, the time of the event and a description. The duo coordinates more than 150 individual events including picnics, dinners, parties, academic department tours, senior projects, campus walking tours, 36 WESeminars, 15 class reunions, a parade, an annual meeting and assembly, a grandparents gathering, a childrens day camp, class photos and of course, the 173rd commencement ceremony. Ebstein says virtually all the universitys departments contribute to the weekend in one way or another. Physical Plant staff spends Saturday night setting up chairs for commencement. Campus Dining prepares more than 90 percent of all meals. The Office of University Communications writes, photographs and edits the brochures and award citations. The Wesleyan grounds crew grooms the campus lawns and flower beds. And all academic departments plan open houses for the weekend. Even students get involved. More than 500 students apply for R&C Weekend employment, but only 150 are hired. They often cover odd-hour shifts, some beginning at 6 a.m. and ending at 2 a.m. the next morning. When planning more than 150 events throughout the weekend challenges are sure to arise. The staff, however, is accustomed to expect the unexpected. About 670 alumni registered for 2005 reunion, however, an additional 350 can show up depending on the weather. The coordinators keep their eye on the numbers, which can affect last-minute food orders, rental orders, tables and table cloths, napkins, tables, chairs, silverware, plates, glasses and even the number of flower and balloon arrangements. Brochures and nametags were delivered incorrectly printed. the University Relations staff stayed up throughout the night to get them finished days before the event. A picnic ran low on turkey sandwiches forcing, students, staff and campus dining crew to scramble to locate lunchmeat and make sandwiches during the picnic. When rain poured for seven days before commencement, the Wesleyan grounds crew laid a makeshift mulch road so vendors could get onto the flooded field. A water main broke one year forcing the coordinators to reroute shuttles through campus at the busiest time of the weekend. A tent fell over just before an all-campus picnic. When the 2000 fireworks show went off with a bang, it left a blanket of soot on the commencement chairs and stage overnight. Physical Plant staff had to hand-wipe all 10,000 chairs clean before morning. Members of University Relations and Physical Plant are assigned different tasks, but among the most important are to be the eyes and ears of the university. All problems and questions are communicated through cell phones and radios. Seventy-two of them to be exact. Crunch time for University Relations begins in March when brochures are mailed off, a Web site is developed and registration begins. In May, the staff begins working longer hours and weekends. During the R&C weekend, some of them sleep an average of two hours a night. The staff includes Makaela Steinberg, associate director of Alumni Relations; Linda Kavan, associate director of Events, Suzanne Kampen, administrative assistant with Alumni and Parent Relations; Gail Briggs, associate director of Alumni Education, Meg Zocco, director of Parent Programs and Camille Dolansky, assistant director of Parent Programs. 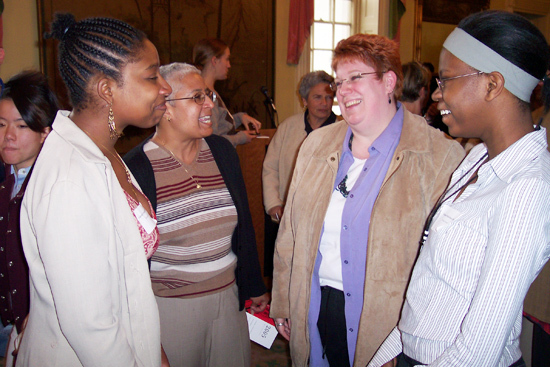 Jean Shaw, now coordinator of University Lectures, was the overall coordinator from 2000-2003, helping to combine the once separate reunion and commencement celebrations into one event. The hectic schedule affects their personal life, and Hutson and Ebstein say it takes an understanding family to get through it. Hutson compares planning for R&C Weekend like a running up a hill. After R&C Weekend, the University Relations staff sends evaluation assessments to alumni. 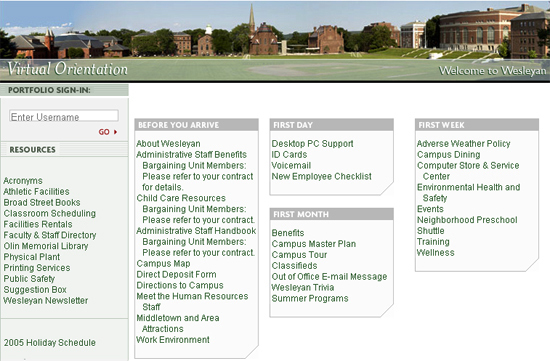 Feedback lets Wesleyan know theyre efforts pay off in the end. And then on Monday, the planning starts for 2006. Pictured in center, Migdalia Pinkney, administrative assistant for the Center for Community Partnerships and Lisa Currie, director of Health Education, congratulate Gabrielle Tynes-Labonte 06 (left) and Vladrose Petit-Frere 05 during the Academic Awards, Prizes and Scholarships program May 3. The students both received the Mosaic Award, given to four students who have brought about cultural awareness and education on race, ethnicity, culture or sexual orientation. 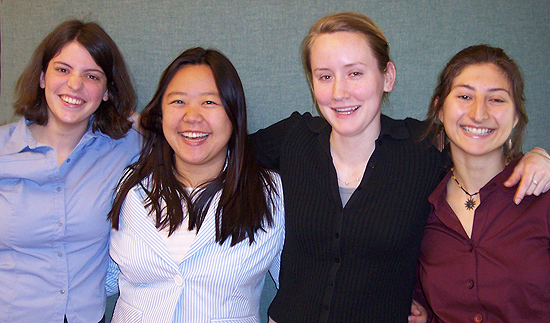 More than 240 Wesleyan students received accolades and formal recognition during the 2005 Academic Awards, Prizes and Scholarships program May 3 in the Russell House. These are honor students who represent the highest ideals of Wesleyan University: intellectual curiosity, academic excellence, creative expression, leadership and service, says Peter Patton, interim dean of the college, vice president and secretary of the university and professor of earth and environmental sciences. Students were honored for excellence in astronomy, music composition, biology, chemistry, earth and environmental sciences, mathematics, history, film, women studies and computer science, among other subjects. Others earned awards for demonstrating outstanding leadership, special aptitude in the history or art, debating and public-spirited citizenship. While celebrating these recipients of awards, prizes and scholarships, Patton also honored and thanked alumni and friends for their generous contributions and gifts. Several awards are the result of legacies of alumni, administrators, faculty and friends whose lives and work are honored through endowed gifts. 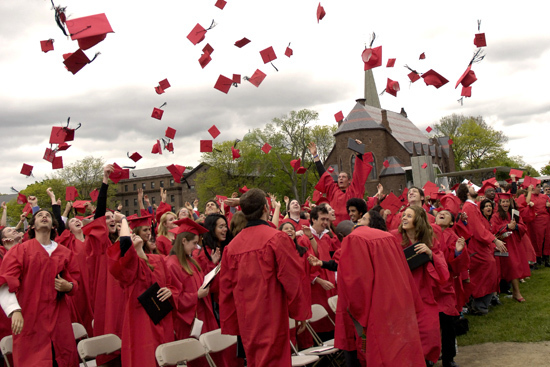 More than 700 students graduated from Wesleyan May 22. During the last four years, Wesleyan University students have generated responses to the 9-11 terrorist attacks, the war in Iraq, the genocidal crisis in Darfur, the Tsunami of 2004 and several other events. In his commencement address on Wesleyans campus on Sunday, May 22, Wesleyan President Douglas J. Bennet `59 urged the 718 undergraduates from the Class of 2005 to continue their good work. My commencement wish for each of you is that you never lose your instinct for challenging the society around you, Bennet said. The commencement speaker, Amy Gutmann, president of the University of Pennsylvania, echoed Bennets remarks but also asked students to adapt an attitude of mutual respect. Gutmann added that mutual respect is the life blood of democracy and yet has become more scarce in a society that seems increasingly polarized and partisan. Without mutual respect, democracy is dead, and so are your prospects for living in a just and peaceful world, she said. Students also heard from New England Patriots Head Coach Bill Belichick `75, P `07, who received an honorary doctorate from the university during the ceremony. Belichick urged the graduates to give heed to their passions rather than taking the easy way out. Along with Belichick and Gutmann, Pulitzer prize winning author Edward P. Jones and William Barber, the Andrews Professor of Economics Emeritus at Wesleyan also received honorary degrees. Wesleyan bestowed the Baldwin Medal, the highest alumni honor presented by the University, to John F. Woodhouse, `53, P `79, a Wesleyan alumnus, former president and CEO of Sysco Corporation, and trustee emeritus, chairman and leader of the first-ever Wesleyan Capital Campaign that raised $287 million. The Baldwin Medal pays tribute to the late Judge Raymond E. Baldwin of Wesleyan’s Class of 1916. Baldwin was the only man to have held the offices of Connecticut governor, U.S. senator, and chief justice of the Connecticut Supreme Court. Along with the 718 bachelor of arts degrees, Wesleyan also awarded 14 Ph.D. degrees, 40 master of arts degrees in individual fields, 65 master of arts in liberal studies degrees and two advanced certifications. Wesleyan also honored and recognized its alumni from the World War II era during the ceremony. Four Wesleyan students have discovered that one out of five local children lives in a household that suffers from food insecurity. Beth Coddington 05, Tiffany Lo 05, Amelia Long 06 and Maria Nankova 05 presented results of their study, “Hungry Children in Middletown on May 12. The students were enrolled in the Community Research Seminar taught by Rob Rosenthal, professor of sociology. The Middlesex Coalition for Children commissioned the survey. The projects purpose was to assess the rate of food insecurity among Middletown households with children under 18. The students found that 20.1 percent of Middletown children (1,883 children) were living in food-insecure households during the past 12 months. Of those children, 15.5 percent (1,452 children) experienced food insecurity in their household but were shielded from actual hunger. However, the other 4.6 percent (431 children) experienced food insecurity with hunger within the past year. The rest of Middletowns children, an estimated 79.9 percent (7,481 children) lived in houses that were food secure. They also found food insecurity is about as prevalent in Middletown as it is in the U.S. as a whole  nationally with 16.7 percent of households with children were food insecure  but food security with hunger among Middletown households with children exceeds the national average of 3.8 percent. The results are based on 329 telephone and paper surveys, administered by the students and local organizations. The survey was designed by the USDA and is currently used by the federal government to measure food insecurity at the state and national level. The students made calls between 5:30 and 8:30 p.m. Monday through Friday and 11 a.m. through 4 p.m. Sunday. Lo, an earth and environmental science major, chose to take part in the research project to integrate herself in the Middletown community. The students also asked people about their coping strategies for when they were running low on food or money to buy food. The students found a trend of higher usage of food pantries than food stamps among Middletowns more food-insecure and lower income households, something that differs from the national tendency. Long, a government major, said the food-secure families surveyed were surprised to hear so many households in their own community were having trouble affording food. Also, a lot of people seem to think that individual factors like laziness and poor spending habits are the biggest factors contributing to hunger in families as opposed to bigger structural issues like outdated income qualifications for food stamps, Long says. The research project grew out of the past years work by the Middletown Childhood Hunger Task Force. The Task Force was prompted by the discovery that some Middletown families with pre-schoolers didnt have enough food. Composed of local anti-hunger agencies, the Task Force is co-sponsored by the the Middlesex Coalition for Children and Middletown Mayor Domenique Thornton, who attended the students presentation. Now that the students have documented their findings, they are working on ways other Wesleyan students can further help the reduce or eliminate problem in the future. From left to right, Ambika Ahuja 05 of Thailand, Zaheed Essack 05 of South Africa, Phudorji Sherpa 05 of Nepal, and Lianne Morris-Smith 05 of Jamaica converse at the International Student Senior Reception. 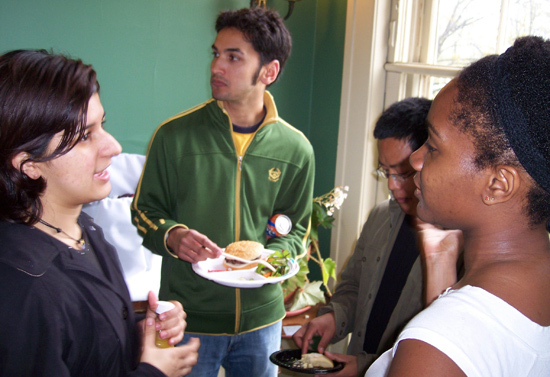 The Office of International Student Services held an International Student Senior Reception at the Russell House April 27. More than 25 international students and exchange students attended. Some gave brief remarks about their experiences at Wesleyan while others mentioned ways they plan to stay connected with Wesleyan after graduating. Whether they stay in this country or travel back to their home country, these students can maintain a relationship with Wesleyan, says Theresa Cann, coordinator of International Student Services. Wesleyan staff, administrators, and faculty attended, including the Senior Class Dean, Louise Brown. More than 150 guests, many from academia and the pharmaceutical industry, attended the 33rd Peter A. Leermakers Symposium May 5 at the Exley Science Center. The annual, one day meeting brings together internationally recognized chemists for a day of intensive examination of a particular subject in chemistry. This years symposium, titled Chirality, united scientists working in the general area of stereochemistry. The speakers have played a fundamental role in the control and understanding of stereochemistry. Stereochemistry is a property that certain molecules have that can make two molecules behave completely differently as drugs, even though the structures of the two molecules look very similar. Stereochemistry depends on the symmetry of a molecule and is very difficult to control when one is synthesizing the molecule. Speakers of the day-long event included Judith Brown, vice president for Academic Affairs and provost; Michael Frisch, visiting scholar in chemistry; Professor Kendall Houk from the University of California, Los Angeles; Professor David Evans from Harvard University; Edward Grabowski from Merck Research Laboratories; Professor Eric Jacobsen from Harvard University; and Professor Geoffrey Coates from Cornell University. The speakers presented results related to asymmetric catalysis, the synthesis of stereoregular polymers, the computer modeling of stereoselective reactions and the use of spectroscopy. These scientists are all at the very top of their fields and have been recognized by numerous awards, says Michael Calter, associate professor of chemistry and chair of the Leermakers Symposium. The first symposium was held in 1972 on the chemistry of vitamin B12 and featured the late Robert B. Woodward, who reported on the just-completed total synthesis of this complex molecule. Since then topics have included natural biology, theoretical chemistry, extraterrestrial chemistry and chemical reaction dynamics. The symposium was funded by Bristol-Myers Squibb, Pharmaceutical Research Institute, Merck Research Labs and Pfizer Global Research Division. 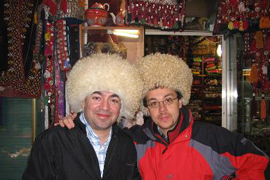 At left, Wesleyan Jewish Chaplain Rabbi David Leipziger and Muslim Chaplain Imam Abdulla Antepli try on traditional Turkmenistan hats in an Egyptian Bazaar. 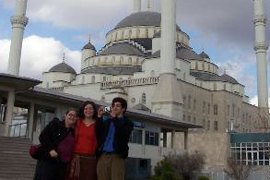 At right, Jessica Strom 07, Alana Miller 08 and Jeremy Gillick 07 observe the only mosque in Ankara, Turkey. What is life like in a secular Muslim nation, especially for Jews? This was the question that motivated 17 Wesleyan students  12 Jewish, 5 Muslim  to go to Istanbul, Turkey, in March during spring break to see for themselves. The eight-day trip, which was envisioned and created by Wesleyans Muslim Chaplain Imam Abdullah Antepli and Wesleyans Jewish Chaplain Rabbi David Leipziger, was discussed at a presentation on April 19 in Judd Hall. Leipziger says the objectives of the inter-religious trip were to study successful Jewish-Muslim coexistence in Istanbul, to interact and build bridges with the Jewish and Muslim communities and to visit major religious and historical sites. Most importantly, we wanted to them to learn about each others backgrounds in order to build strong and vibrant inter-religious programming at Wesleyan, he says. During the discussion, nine of the students took turns discussing their views on the countrys politics, government, social interactions, impressions of the country and interactions between the Wesleyan students. Dan Janvey 06 of New York, N.Y., presented a short documentary on the trip, which included clips of a mosque, prayer, music, and personally delivering a Wesleyan T-shirt to a chief rabbi. Students went on guided tours through Istanbul. Destinations included old Istanbul, a Jewish museum, the Turkish parliament, and a historical home in the Galata area. The students also went to an Egyptian Bazaar, mosques, Faith University, a Turkish music concert, Topkapi Palace, Basilica Cistern, a sufi dance performance, and a Muslim prayer service. The students influential religious and secular leaders in the city, including Chief Rabbi Ishak Halevo and local Jewish leaders, Turkish journalist Ekrem Dumanli local Christian leaders, as well as Vatican representative George Marovitch, and Turkish peace activists and interfaith workers. They also met with U.S. Ambassador Eric Edelman in the U.S. Embassy. But it was during dinners that the students received the most personal interaction with the Turkish people. Every night theyd share a meal at a local residents home, one night with a Muslim family, the next with Jewish hosts. Yaneez Nojib, 08, of Saint-Pierre, Mauritius, said for a few of the Muslim families, this was their first time hosting Jews in their homes. They also allowed the Jews to pray in their living rooms during Sabbath. The country of Turkey has welcomed Jews, expelled from Spain, and Muslims since 1492. Because Turkey is a secular state and forbids census-takers to include questions of religious affiliations, the exact number of the Jewish population is unknown. By 1477, Jewish households in Istanbul numbered 1,647 or 11 percent of the total, and the present estimation is around 26,000, with the majority living in Istanbul. Although Judiasm has a small presence in Turkey, among nearly 70 million Muslims, Andrew Inchiosa 07 of Woodcliff, N.J. says the Jewish community is evolving with the Turkish culture. During a Shabbat service, one practice seemed especially anomalous to the group. Inchiosa says there were also few religious divisions from a culinary standpoint. The students were served Turkish tea at many different religious functions, and experienced a version of Turkish delight, featuring milk chocolate, at the home of the ambassador to the Vatican. Other students who went on the trip were Alana Miller 08, Jeremy Gillick 07, Jessica Strom 07, Leora Abelson 07, Saad Mustafa Handoo 06, Marie Brophy 08, Lillian Siegel 08, Nitzan Ziv 07, Jacob Goldin 07, Ben Smyser 08, David Abravanel 08, Emiria Wijayanti 07, Joel Bhuiyan 06 and Nabil Ansari 06. Handoo, of Clarksville, Md., says the students want to reach out to area newspapers, deliver presentations in their hometowns, write articles for Turkish newsletters, hold discussions and conferences about their trip, and reach out to Wesleyan alumni regarding their interfaith experience. Now that we have this knowledge, we want to share it with a broader base and other religious circles, he says. What we have been through has been a transforming experience. Another trip is being planned for March 2006. Anyone interested in ordering a DVD of the students’ documentary, or having the Wesleyan students make a presentation at individual synagogues, mosques, schools or other venues, contact Rabbi Leipziger at 860-685-2278 or dleipziger@wesleyan.edu. Kirk Davis Swinehart, assistant professor of history, has been spending most of his time in the 18th century with an Irish knight and a Mohawk woman. Swineharts research and teaching focus on events from the period just before and leading up to the American Revolution. He has also done extensive research on the New World soldier-adventurer Sir William Johnson (171574) and his families, Irish and Mohawk, both of which fought for Britain during the American Revolution. Funded by an Andrew W. Mellon Foundation Faculty Career Enhancement Grant, Swinehart will spend next year finishing his book on Johnson and his Mohawk common-law wife Molly Brant. Swineharts book, tentatively titled Mollys War, is a narrative that recounts an intimate history of the Crowns uneasy military alliance with the Mohawk Indians of central New York. The story chronicles Sir William Johnsons 20-year relationship and domestic life with Brant (173696), a powerful Mohawk woman who struggled to maintain the Mohawks allegiance to George III after Johnsons death. The book is under contract with Houghton Mifflin in North America and Hodder Headline in the United Kingdom and British Commonwealth. Swineharts Mollys War derives its narrative verve from the events and places that shaped Brant and Johnsons lives: their childhoods in the New and Old Worlds; the circumstances of their meeting and subsequent two decades together; the building of the estate they shared uneasily with their eight children and with Johnson’s three white children; and the two decades Brant spent without Johnson, waging war and living as a single mother confronted with heartbreaking blows. Many have written about Johnson since his death in 1774 but too often he has been depicted as a caricature of the British colonial official. Swinehart says his research, conducted in British and American archives–including the British Library, the Public Records Office in London, and in Sir William’s own published papers–suggests a more complicated portrait than the ones offered by previous biographers and scholars. Swinehart says Johnson was a devoted father, a great lover of fun, and a man of tremendous intelligence and empathetic powers. To complement his research, Swinehart spends time in physical locations where Johnson and Brant lived. He has spent extensive time at the house they shared, Johnson Hall, which still stands, 45 miles northwest of Albany. This summer, hell be in London, searching for the familys banking records, and in Dublin, visiting Johnsons childhood house. Swineharts interest in Johnson and Brant dates back six years. After earning a masters degree from the University of Delaware, where he studied American decorative arts, he pursued a Ph.D. in American Studies at Yale University. While at Yale he studied with prize-winning colonial historian John Demos, who changed forever how Swinehart writes history. That is when he began his doctoral dissertation on Johnson. Swinehart says he hopes to spend his life doing work that combines scholarly rigor and accessibility in equal measure, inside the classroom and on the page. Students, he finds, learn best about early American history when people and life stories are placed front and center: when enormous social and economic changes can be discerned in the life of a James Boswell or a Benjamin Franklin or a Molly Brant. At Wesleyan, Swinehart has taught all self-designed courses. These include the survey of early American history, narrative nonfiction and historical biography and the British Empire, a seminar on the Puritans, and another on early American furniture and art. 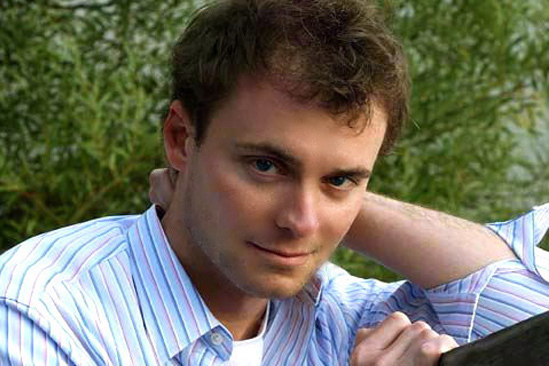 In addition to the Mellon Foundation Career Enrichment grant, Swinehart is the recipient of a Yale College Teaching Prize and of fellowships from the University of Pennsylvanias McNeil Center for Early American Studies, the Mrs. Giles Whiting Foundation, the Huntington Library in Los Angeles, and the New York Public Library. Prior to coming to Wesleyan in 2002, he was the Mellon Research Fellow in American History at the University of Cambridge. Amy Gutmann (Doctor of Letters)  Amy Gutmann, Wesleyan’s commencement speaker, became president of the University of Pennsylvania this year. Formerly, she was provost and Laurence S. Rockefeller University Professor of Politics and the University Center for Human Values at Princeton University. She was the founding director of the Princeton University Center for Human Values, a multi-disciplinary center that supports teaching, scholarship and public discussion of ethics and human values. Bill Belichick (Doctor of Humane Letters)  Bill Belichick earned his bachelor’s degree in economics at Wesleyan in 1975. Also a Wesleyan parent, Belichick and his wife, Debby, have been long-time advocates of and contributors to Wesleyan and community charities. In 2002 Coach Belichick guided the underdog New England Patriots to their first world championship, against tremendous odds. He has since repeated that feat twice, most recently this year at Super Bowl XXXIX. Belichick has earned a reputation for being one of football’s elite game strategists whose defensive game plans have consistently been credited for defusing some of the NFL’s most potent offenses. Edward P. Jones (Doctor of Humane Letters)  Edward P. Jones was educated at Holy Cross College and the University of Virginia. His first book, Lost in the City, was originally published by William Morrow in 1992 and short-listed for the National Book Award. A collection of fourteen short stories, Lost in the City deals with African American working class and underclass experiences in mid-20th century, inner-city Washington, D.C. Jones was named a National Book Award finalist for a second time with the publication of his debut novel, “The Known World,” which subsequently won the 2004 Pulitzer Prize for fiction. William Barber (Doctor of Letters)  William Barber is the Andrews Professor of Economics Emeritus at Wesleyan. Barber joined the Wesleyan faculty in 1957 after receiving his doctor in philosophy degree from Oxford University. He is recognized as an expert on the history of economic thought, on economists as policy advisers, and on development economics. His next book, Volume 4 of “Perspectives on Applied Topics and Forward Trajectories,” is expected to be published in 2005. Wesleyan will also bestow the Baldwin Medal, the highest alumni honor presented by the University, to John F. Woodhouse, ’53, P’79, former president and CEO of Sysco Corporation, named trustee emeritus following 15 years on Wesleyan’s Board, and most recently, chairman and leader of the successful $287M Wesleyan Capital Campaign. David B. Jenkins, ’53, P’83, former CEO and president of Shaws Supermarkets, named trustee emeritus following 12 years on Wesleyan’s Board, chair of the Campaign for Liberal Learning and National Leadership Gifts Chair for the Wesleyan Capital Campaign, will receive the Baldwin Medal at Homecoming/Family Weekend this fall. A new grant will expand emphasis on computer science instruction and resources. An $800,000 Mellon Foundation grant will allow the Mathematics and Computer Sciences departments at Wesleyan University, Connecticut College and Trinity College to collaborate on a new cost and resource sharing arrangement, expand the departments curricula and provide incentives for more computer science faculty to work in a liberal arts setting. The grant will fund the hiring of four post-doctoral fellows in computer science who will develop new courses, seminars and workshops. While each fellow will be employed by a home institution, all four will provide instruction and collaborate with colleagues at the three participating academic institutions. This will include on-site instruction and the simultaneous teaching of courses at the institutions through video conferencing. The grant also focuses on providing resources for the recruitment, mentoring and training of women and underrepresented students in computer sciences. Methods will include faculty and peer mentoring, workshops and programs on career and research opportunities, and the creation and distribution of materials aimed at interesting nontraditional students to enroll in introductory computer science courses. 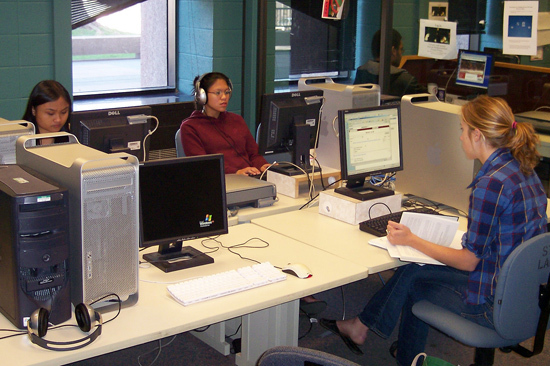 Wesleyan University, Connecticut College and Trinity College have enjoyed a long tradition of academic collaboration known as the CTW Consortium, which includes sharing instructional technology and library service resources. In recent years, the Mellon Foundation has also awarded grants to the CTW Consortium to sponsor a computer sciences joint colloquium and to build on existing shared resources to improve the curricula of all three member institutions. The Andrew W. Mellon Foundation is a private foundation that makes grants on a selective basis to institutions in higher education, museums, and art conservation, performing arts, population, conservation and the environment and public affairs.